A very warm welcome to all of you who are joining us for the first time at College Street this year, and welcome back to everyone else. Much has been achieved over the summer, with many trips and events seeing Grammar boys and staff in action around the country, with the cricketers in Brisbane in the Tri-Grammar Series, our volleyball boys down in Melbourne for the Nationals, the rowers on tour in New Zealand and the tennis players also in Melbourne for the Australian Open. It has also been a summer of outstanding HSC results for the 2018 cohort. I congratulate all of last year’s Form VI on their fine HSC results. To put their collective achievements in perspective, the 2017 HSC results had essentially been our best to date in the history of the current HSC. In 2017 an impressive and unprecedented 25% of boys scored an ATAR of 99 or better. Outstanding results indeed. Yet in 2018 we saw that measure rise to 30% of last year’s Form VI achieving an ATAR of 99 or above. And whilst it would be easy to continue reporting various statistics, it is more important to recognise how well all the boys performed in their examinations. It is also exciting to see a good number of boys being offered places to study at Oxford and Cambridge, amongst a range of other impressive national and international universities. Nonetheless, the School is about much more than public examination results. The best universities around the world are making it increasingly clear that good marks in examinations are only part of what they seek when they look for the best undergraduates. All boys at Grammar are encouraged to involve themselves as much as they can in life outside the classroom. Indeed, I would argue that the success of Grammar boys in measurable areas such as the HSC is the product of factors not always so visible. The School’s outstanding teaching and support staff, the underlying pastoral structure, the highly aspirational approach to sport, music and the arts variously combine to provide the Grammar boy with a community of interesting, exciting and ambitious people keen to learn more and achieve more. This is a school where we encourage boys to be independent as soon as possible. Some of the practices common in other schools are not found here and it is all the more important that you know how we communicate with you, and how you can readily communicate with us. In particular, you should make sure that you know the name and contact details of your son’s Tutor because he or she will be the primary point of contact between home and school for most everyday matters. Tutors are drawn from the ranks of the teaching staff, and their role is one of general co-ordination and supervision. Should you have concerns which you feel cannot be adequately addressed by a Tutor, then you should contact the Master of the Lower School, Mr Hesketh, in the case of First Form boys, or your son’s Housemaster for boys in all other Forms. Very serious matters should be reported directly to my office; in such cases, you will then be contacted by the Senior Master, Mr Kavanagh, who works closely with me. In the very near future we will be launching the new Parent Portal and I will email you more information about this. In the meantime, if you look at the calendar on our website you will see that many concerts, plays, debates and fixtures occur throughout the year. You are welcome – in fact strongly encouraged – to attend whenever you wish. Some events require bookings, others do not. (Where bookings are required, it is most important that you advise us if for some reason you are subsequently not able to attend. We have waiting lists for some of our events, and we do not like to turn people away – say – from concerts or lectures which end up having unexpectedly empty seats.) Many parents attend events in which their own sons are not involved. The School has strong links with outside organisations including professional orchestras, academic societies, libraries and universities. Again, when they hold activities at College Street, you are most welcome to join us. Grammar is a large school, and it serves many different communities in our city. As a result, it can be a little daunting at first - especially for parents. This is why we have a range of active parent organisations including the Women’s Association, the Fathers’ Association, the Music Association and the Parents and Friends of the Boatshed. These groups provide the School with financial support, but more important than that, they provide social opportunities for parents to meet each other. Some of the best attended activities of the Women’s Association, for example, are those which have nothing to do with the School, or boys’ education at all. I should add that weekly sporting fixtures, especially at Weigall, provide an excellent opportunity for informal conversations both with other parents and members of staff, myself included. I wish you all the very best for the academic year ahead. The Headmaster is available whenever he is not otherwise occupied to see boys without appointment. Welcome back and best wishes for the year ahead. Could you please assist us by ensuring your son's bags, clothing, equipment and books are labelled at the start of the school year. Last year, a significant number of unnamed clothing items and bags found their way into Lost Property. Boys should chase up any lost property items promptly with one of the School Sergeants. You may be interested that I made a point last week of alerting the boys to the safety risks posed by traffic when moving across the city, especially when crossing busy city streets. I also reminded boys of the School’s mobile phone policy. I have repeated this policy below. Boys in Forms II to V in 2019 are required to place their phone in their locker when they arrive at school. As such, their phones may not be used during school hours except for essential communication (e.g. contact with a parent or carer may occur at a boy’s locker out of class time if strictly necessary). In the interests of safety, boys are also allowed to take their phones with them into the city at lunchtime but they must return them to their lockers before period 6 and they must not have them visible walking through the School grounds. At the conclusion of the day, boys will then collect their phones from their lockers. We have found that the majority of boys have adjusted well to this change of routine and we feel the change has been a positive one. Thank you for your ongoing support of this policy. As part of their Form VI privileges, boys in their final year will be allowed to access their phones in the Green Zone playground area throughout the school day. Form VI boys should not access their phones in other areas of the School. As senior boys they need not lock their phones away in lockers during the day. Each boy has been assigned a new locker at the start of the Term. Boys have been reminded that they must provide a lock for their locker to secure their books and valuables, and should use their lockers as part of their daily routine. Valuable items such as phones, wallets and books should be locked in lockers and not left unattended in bags. Each boy should now have a functioning lock on his locker. Boys must arrive at school in time for the first bell at 8:39am. Form VI boys may arrive in time for their first period of the day. Boys who arrive late must register on arrival at the General Office, where they will be given a note which they must take to class. Lateness in Forms II to VI will be followed up by the Senior Housemaster or one of the Deputy Senior Housemasters and a parental note will often be required. Housemasters have issued boys in Forms II, III and IV with lunchtime passes (light green in colour). Any boy in Forms II, III or IV who wishes to visit the city at lunchtime must have his parents sign the card indicating permission and then present the card to his Housemaster for countersigning. The privilege of visiting the city at lunchtime is contingent upon boys being of good behaviour while in the city and returning in good time for their first lesson after lunch. The privilege may also be withdrawn by a Housemaster if a boy’s general conduct is unsatisfactory. If your son is unable to attend school, you must telephone the main switchboard on 9332 5800 from 8:00am on the morning of the first day of absence and on subsequent days if illness continues, preferably by 9:00am. Absence from school must be explained by a letter, signed by a boy’s parent or guardian and brought to school by the boy on the day he returns. Letters should be submitted at Masters’ Reception (or to the Master of the Lower School’s Secretary in Form I). Alternatively, an email can be sent to senior.housemaster@sydgram.nsw.edu.au by a boy’s parent or guardian. The letter or email should clearly indicate the boy’s name, Tutorial and Form. If a boy is absent in the first period of the day and no notification has been received, parents will be contacted for clarification. Applications for short leave for any part of a school day must be made in writing to me for boys in Forms II-VI at least 48 hours before the nominated day. In keeping with our aim to minimise any disruption to classes, short leave is only approved where strictly necessary. When applying for short leave by email, parents should address emails to senior.housemaster@sydgram.nsw.edu.au rather than their son’s Housemaster or Tutor. Please mark to the attention of the Senior Housemaster. Boys in Form I should make their applications for short leave to the Master of the Lower School, Mr Hesketh. All correspondence should be prefaced with the boy’s full name, Form, House and Tutor. Boys on short leave are required to sign in and/or out at Masters’ Reception on the day of approved leave at the appropriate time. Form VI boys must remain at College Street during free periods and must behave appropriately at all times. They may take refreshments from the Tuckshop. Form VI boys are also advised to make good use of the library during free periods to keep up with the academic demands of their final year. Standard rules apply for leaving the School at lunchtime as for other Forms. If Form VI boys have a free period after lunch, then they may have an extended lunchtime visit provided they return in plenty of time for period 7. I will provide more detailed information in coming weeks. Mufti Day for this term is Tuesday 12 March (F Day). The convention is that a boy on Mufti Day donates a “gold” coin through his Tutorial to the Prefects’ Charity. This year the Prefects are supporting AIME, the Australian Indigenous Mentoring Experience, a charity which works to improve educational outcomes for indigenous youth. I have reminded boys that if there is a need for email communication between a boy and a staff member, that the boy must only use his School email account and the School email account of the staff member. Boys in Form III who have turned 14 are now eligible to sign up for the Duke of Edinburgh's Award at Sydney Grammar School. Boys need to undertake a skill, some volunteering and sport, as well as the adventurous journeys conducted in the school holidays. Please refer to the School website under ‘Other Clubs and Activities’/Duke of Edinburgh for further information or boys can come and see me in my office, opposite WM3. For each of the other areas, Volunteering, Skills and Physical, boys should set up the correct assessor in each category. They should NOT nominate me as the assessor unless it is for School Orchestra. For school sport, Mr A Campbell is the assessor. Please download the following document about the ‘Duke of Edinburgh's Scheme at Sydney Grammar’ (click here) to obtain other assessors. Please note that all permission forms for the Duke of Edinburgh's Award Adventurous Journeys (only for those to be undertaken in the coming April holidays) are due by Wednesday 20 March. Any forms received after that date run the risk of not being processed in time and hence, the hike may not be counted towards a boy’s award. The hike form permission is also on the School website (please download the current form). Boys currently in Form VI should look carefully at their completion plans to avoid panic at the end of Term III when they are trying to get their records signed off by their assessors and me. This will be held on Thursday 7 February in Big School at 6:30pm and is a wonderful introduction to the musical life of the School. In addition to performances from several ensembles, members of the Music staff will provide important information about the Music Department. We will talk about private lessons, music ensembles and the classroom programme, as well as introducing members of the Music Department. Family members, including siblings and grandparents, are welcome to join us on the night. The Captain of Music and other boys in Form VI will also be available to speak about various aspects of the programme and their personal experiences. The Music Association will host a short supper at the conclusion of the concert. Limited parking will be available in the middle playground from 6:00pm. Parents and boys are welcome. Friday 8 March is International Women’s Day and we will celebrate and acknowledge this day with performances by Sydney Grammar School Jazz bands. Our special guest, Dr Sandy Evans, will lead the Stanley Street Big Band, Big Band and Dr V’s Swing Thing during the first half of the concert following a full day of workshops. We are also fortunate to have the Best World Music band in Australia – Marsala perform for us. The concert will be held in the AMT and will start at 6:30pm. Please invite your mothers, sisters, family and friends to attend this very unique and entertaining concert. Tickets will be available via Trybooking. (Trybooking details will soon follow). Forms are available from the Music Department or can be downloaded from the School website. Please ensure that they are completed as soon as possible to allow lessons to commence immediately. There are limited vacancies. Please contact Mr Wagner on 9332 5886 if you would like more information. The following policy applies to the cancellation of private instrumental lessons. A letter or email must be received by the Music Department no later than the end of week 5 of a term for the cancellation of instrumental lessons to be effective at the end of that same term. Therefore advice for discontinuing instrumental lessons at the end of Term I must be received by the Music Department no later than Friday 1 March. All boys who learn an instrument at the School are automatically issued with a gold-covered Instrumental Record Book. Parents are asked to check these books regularly, as they outline the work that should be done in home practice sessions each week. A signature from either parent should be added to the relevant section to verify the time spent on practice. Weekly concerts begin on Wednesday 6 February in the Wallace King Room on Level 7 at 12:55pm. These concerts are held most Wednesdays at lunchtime and afford the boys the opportunity to perform solo and chamber works. Boys wishing to perform should contact Mr Nijs in the Music Department. Please note that boys needing an accompanist must hand in the accompaniment music two weeks before their scheduled performance. All boys, masters and parents are warmly invited to attend these concerts. Requests for exemption from music rehearsals or performances must be made in writing to the Music Department. Three days notice is required except in unforeseen and urgent cases. 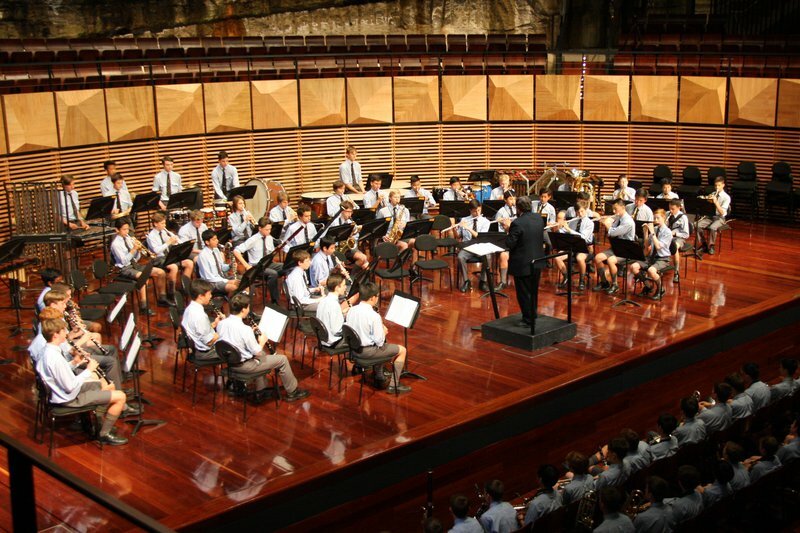 Please call the Music Department on 9332 5895 if you are not sure which ensemble your son has been placed in. A list of this year’s Concerts can be found by clicking here. 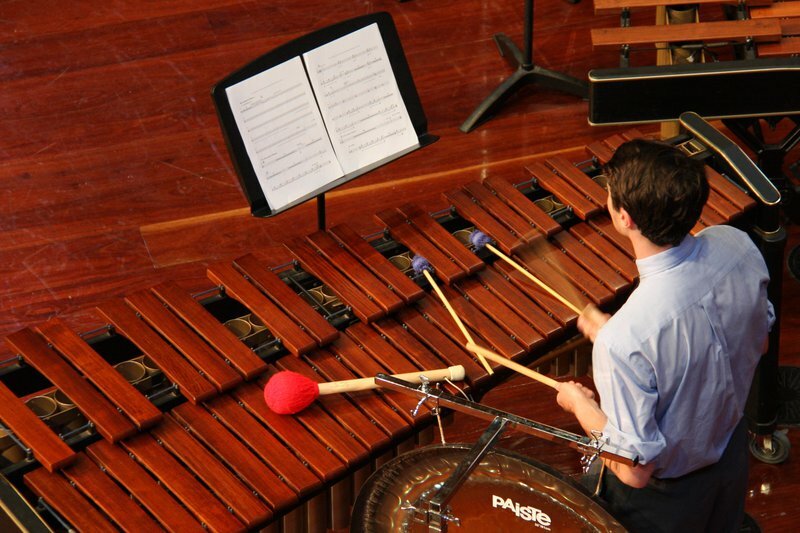 Sydney Grammar School are excited to host the 21st Australian Combined School Music Festival (ACSMF) this year. This is a call out to all Sydney Grammar School families who would like to and are able to billet students attending this Festival. Over 300 ACSMF students from over eight high schools around Australia will need to be accommodated during the Festival which will be held from Wednesday 26 June to Saturday 29 June. Billeting is a rewarding experience for all Sydney Grammar School families and boys as those who have previously been billeted can attest. If you are interested in discussing the wonderful opportunity to billet a ACSMF student, please contact Ms Francisca Sjahry on 93325895 or email FOMS@sydgram.nsw.edu.au. Further information is available on the Festival website www.acsmf.com. At the Headmaster’s Assembly on Friday 1 February, the Captain of Basketball, Leon Ortega, presented the First basketball team to the Headmaster. Representing Grammar in the 2019 season are Leon Ortega(c), Christopher Choi, Richarde Li, Ross Poole, Benji Schwartz, Jerome Ayad, Aaron Heydon, Stirling Smith, Ned Kingston and Albert Chedid. The team will be coached by Mr Mahesh Padmanabhan (OS 2005). The Captain of Tennis, Peter Sanki, presented the First tennis team consisting of Peter Sanki(c), Cian Bowes, Jeremy Wang, Harry Oates, Jeffrey Tse and Evan Leung. The team will be coached by the Director of Tennis, Mr Fernando Ibarrola. Grammar competed at the annual Australian Volleyball Schools Cup (the Nationals Championships) in Melbourne last December. Our senior team consisting of Charles Evans (c), Brandon Chong, James Gao, Finn Parker, William Zhang (all OS 2018), Jared Adams, Mikey Grogan, Peter Taurian, Hugh Lam (all Form VI) and Marcus Allan (Form V) gave Grammar’s best competitive performance in this age group. Faced with a difficult first pool round against schools that had defeated Grammar the previous year, our senior team put up a convincing challenge, stealing sets and a couple of wins against these schools where volleyball is played as the primary sport. Grammar finished a respectable 15th placing in the Year 12 Division 1. Our junior team consisting of Oliver Duncan, Luc Jeffriess (both Form IV), James Castle, Nicholas Coren, Malachy Kalowski, Alex Lawson, Thomas Potter, Ravin Ratnayake, Robert Russell, Kieran Webb (all Form III) was the youngest team we have fielded for Nationals. Competing in Year 9 Division 2, the boys had a steep learning curve after having had only a couple of training sessions together in preparation for the tournament. With eyes wide open to the biggest sporting event in the southern hemisphere, the team’s competitive skills and volleyball knowledge improved exponentially throughout the course of the week. The junior team will help provide Grammar with a firm footing at future National Championships. 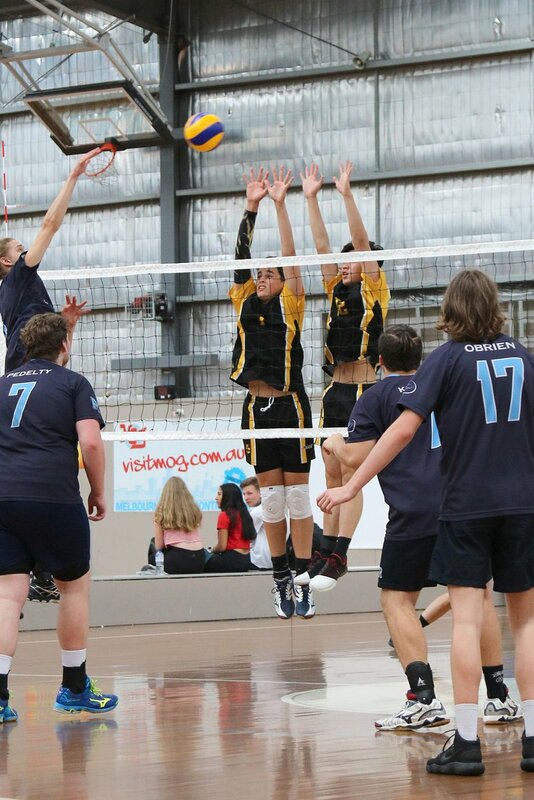 Congratulations also to Mikey Grogan, who having impressed National scouters at the event, has been invited to attend the AIS Junior Men’s Volleyball Camp in Canberra this summer. We wish him the very best with this opportunity. Sydney Grammar School 120 (Max Glen 30) lost to Brisbane Grammar School 6/133 (Will Rogers 2/13, Milan Swaraj 2/15). 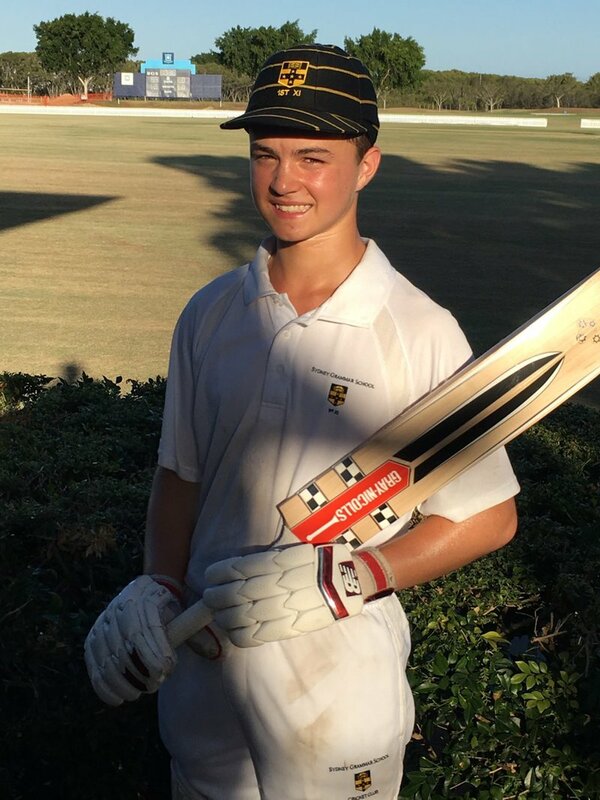 Sydney Grammar School 2/179 (Ethan Kooner 78, David Matthews 77) defeated Melbourne Grammar School 114 (Will Rogers 2/6, Ned Swaney 2/19, Callum Brown 2/15). Sydney Grammar School 354 (Max Glen 151 not out, Milan Swaraj 47) lost to Melbourne Grammar School 5/355 on the first innings (Ethan Kooner 2/62). Sydney Grammar School 208 (Jackson Watson 50) lost to Brisbane Grammar School 332 on the first innings (Ethan Kooner 3/39, Will Rogers 2/42). Melbourne Grammar School won “The Bat” and Brisbane Grammar School, the T20 competition. There were some outstanding individual performances by the Grammar boys as indicated and, as a result, four players were selected in the Team of the Week. They were Max Glen, Ethan Kooner, David Matthews and Jackson Watson. Grammar basketball teams continued to work on their game by training in the New Year and competing in various tournaments. The Grammar First and Seconds teams competed in the Trinity Challenge and the highly respected Newington Classic. The Grammar Firsts lost all their games by single digits but the mood remains positive. The Grammar Seconds had outstanding success, having won four games and narrowly missing out on the final. The Grammar 14A and 15A teams both competed in the Kings Cup. Both teams competed admirably with the 14A team winning two of their games in great fashion. The 15A team won four games against quality opposition but lost the semi-final against Scots College. On the 12 January the Director of Tennis Coach, Mr Fernando Ibarrola, and the Assistant Director, Mr John Rimmer, accompanied six boys for a week long development camp in Melbourne prior to the GPS season. The boys used courts in Lalor, North Melbourne, which were ideal to train several hours each day. The evenings were spent going to the Australian Open. This included watching Rafa Nadal in the 2nd Round on the Rod Laver Arena. This immersion in all things Tennis was an ideal way to prepare for the new season. 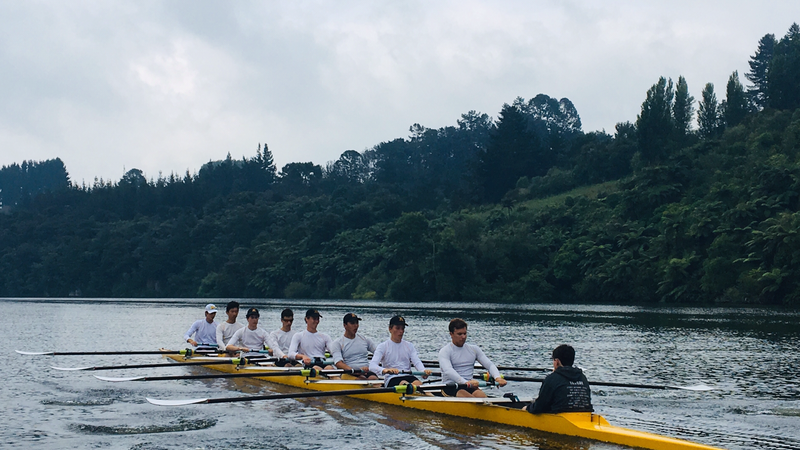 In December, sixteen Grammar rowers and two coxswains ventured to Lake Karapiro in New Zealand to test themselves in a world-class setting. The boys were hosted by the St Peter’s School, members of the Cambridge (NZ) Rowing Club. The boys trained hard for four days before the start of races as an U17 VIII, an U17 IV and an U16 4x (quad scull). The U17 VIII performed extremely well in their heat to qualify for the A-final, finishing only one second behind Shore. The Quad, consisting of Ben Wheen, Jack Sproats, Michael Campbell and Henry Gayst should be congratulated for their selection into two B-Finals. The IV faced tough weather conditions in their two races, and unfortunately did not perform as expected. Please note that rowers attending regattas are expected to travel from the Grammar boatshed to SIRC and return by bus. 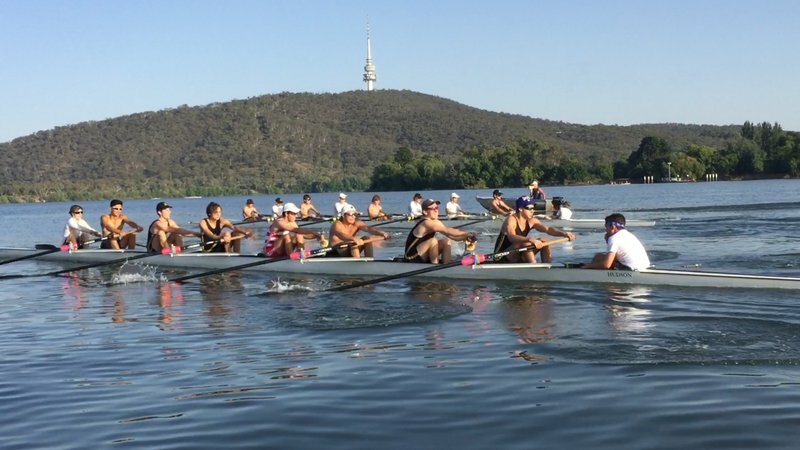 The reason for this is to ensure our crews are correct as per the published crew lists on the NSW Rowing website and to allow the rowing coaches time to submit any last minute changes to rowing officials if rowers fail to turn up. It is also expected that rowers will remain at SIRC until all boats have been de-rigged and loaded onto the boat trailers. Each crew is responsible for their boat. Parents seeking an exemption (for a special occasion) to this policy should make a request in writing to the Sportsmaster. The 146th Grammar Athletics Championships will be held on Wednesday 20 March. The Director of Athletics, Ms Govers, will provide further information through the Tutorial system. All boys are expected to race in the 100m. Boys can register their interest in other events through the House system, in due course. Please note that the Athletics season will officially begin on Monday 19 August, with the AAGPS Athletics Championships at SOPAC on Saturday 21 September. Rugby parents and players are reminded that expressions of interest will be emailed to parents shortly regarding the pre-season holiday activities. With the winter season commencing after the Head of the River (23 March), the holiday program is important preparation for the boys for the start of Term II. Please check Practice Arrangements on the School website to confirm training venues as changes have been made since last Term. Buses returning from Weigall will stop at College Street and Town Hall. Buses from Parklands will stop at Central Station on the way back to College Street. The Sports Office is not in a position to confirm fixtures more than one week in advance. Draft fixtures are published on the School website by Tuesday afternoon prior to the Saturday. Please check the website as late as Friday afternoon to ensure there are no last-minute changes. Parents who have downloaded the Grammar App and registered to receive notifications for their son’s particular sport will receive messages reporting any late changes to both training arrangements as well as Saturday cancellations. Requests for exemption from Saturday games must be submitted to the Sportsmaster at the first possible opportunity and no later than the Wednesday before the game. Training commitments are only two afternoons a week. Parents are asked to refrain where possible from making medical appointments on scheduled training days. Request for leave from sports training should be made in writing to the Sportsmaster. Mr Rob Rowland-Smith (The Sandhill Warrior) coordinates a general fitness program every Monday morning during Term time for any boy interested in maintaining or improving his fitness. The session starts at 7am and finishes at approximately 8:15am. This training is not aimed at any particular sport, and boys from all levels and all sports work together to improve their general fitness. The cost of this is covered by the Sports Department and all boys are welcome to attend. Boys will be asked to select their winter sports choice in Term I. Information will be distributed through Tutorials in the week beginning Monday 18 February. Winter sport choices include cross country, rugby, football, rugby or football refereeing, volleyball, fencing (limited numbers), rifles (limited numbers and approved by the Master-In-Charge of Rifles), winter tennis and taekwondo. Boys are reminded to leave valuables with the Security Officer at Weigall whilst at training. Boys at College Street and other venues should give valuables to their coach. Boys should never leave bags unattended on Saturdays. Parents picking up their boys from training or games must collect them from Alma Street or the Weigall 4 Carpark. Parents are not to park in the Neild Avenue parking area next to the tennis courts as this is reserved for sports coaches. Please be aware that there is no parking available for Grammar parents in the White City carpark. As in past years particular Forms have been allocated to attend specific events as spectators. In the past, the whole School would attend the GPS Head of the River Regatta and the GPS Athletics Championships. From 2014, we have allocated Form IV to attend the Finals night of the GPS Swimming in lieu of the Head of the River. The Finals night of the 2019 GPS Swimming season is Friday 29 March at SOPAC, Homebush. The boys will be transported by bus to and from the venue, leaving College Street at 5:30pm, after receiving a light meal. Boys will be returned to College Street between 9:30pm and 9:45pm. Parents of Form IV boys will have been notified of the specific arrangements by email. The Sydney CBD Schools Careers Convention will be held on Monday 3 June from 3:00pm to 7:00pm in the Palladium Building for boys in Forms IV, V and VI and their parents. It will be held jointly with other schools from the CBD. The Convention will have three facets. In the School gymnasium from 3:00pm, major universities will be present along with a number of private tertiary education providers. In the Palladium Theatre and John Vallance Hall from 4:30pm, there will be a series of talks from faculty representatives and from 5:00pm to 7:00pm, in the Palladium classrooms, advisers from many career and university areas will be available for consultation. If you can assist with this consulting, in your own career area, then please contact me by email as detailed below. Career testing is offered to all boys in Form IV, usually later in Term I. This is an opportunity for Form IV boys to undertake Career Voyage, a careers guidance program. The program uses a boy’s interests and preferences to make twenty job suggestions. Career Voyage can also be useful in preparation for the Career’s Convention and in guiding subject choice for Form V.
Boys who are interested in applying for tertiary education scholarships should be aware that attributes are sought that often go well beyond academic performance. These may include creativity, leadership, self-motivation and communication skills. It is therefore important that boys in Forms V and VI continue with their extra-curricular activities. The Tuckwell Scholarship at the ANU is a sort-after scholarship that it is worth at least $21,700 a year. Applications open on Monday 4 March and information is available here. Work Experience is undertaken in the school holidays, usually when a boy is in Form IV. Boys make their own contacts and arrangements, although Mr Whild may be able to assist. As there are both insurance and child protection requirements for a work experience placement, any arrangement must be first discussed with Mr Whild and the necessary forms will then be made available. Course and Careers advice for local universities and overseas admission is available from the careers master, Mr Whild in SB10 or by email at pjw@sydgram.nsw.edu.au. University and course information is also available in the School Library, on Schoology and on the School website via links to the universities. If you are interested in discovering how the world works around you, I would like to invite you to join other science-minded boys and parents on one of the School’s Science Beyond the Curriculum activities. Join geologist, Dr Ian Graham (University of NSW), and his postgraduate students as they take us on an exciting walking tour of the City of Sydney, investigating the geological composition of its monuments and buildings. Starting with the Hawkesbury sandstone of our own school, we will weave across the city identifying man-made outcrops of marble, granite, slate and other stone types which characterise the durable building materials of early European settlement in NSW. Dr Graham will explain why particular rock types were chosen, sometimes inappropriately, for their intended uses as well as addressing technical and supply issues in maintaining and modifying these structures. We will begin the walking tour at Sydney Grammar School, College Street, and finish underneath the Harbour Bridge. There will be detailed handouts available describing the sites that we visit. At least one parent is required to register for this activity along with their Sydney Grammar School son; however, additional family members are welcome to register as well. The excursion cost is $10 per family. It is generally advised that you register early as positions are limited and may fill quickly. More details will be made available to boys through their Science class. If you are interested in attending, the application form can be downloaded (here). Please ask your son to return it to Masters' Reception by Monday 25 February. Alternatively, completed forms can be emailed to akbb@sydgram.nsw.edu.au. 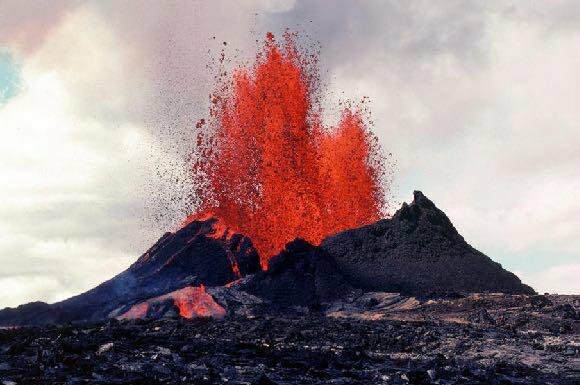 In the last week of the October school holidays, Science Beyond the Curriculum is presenting Grammar boys, siblings and parents with an exciting opportunity to undertake an eight-day geological exploration of Hawaii. DAY 1 – Local orientation and talk on the Big Island. DAY 4 - South Point Day: Hike to Green Sand Beach (swim). Dinner on a black sand beach and turtle watching. Hike on easy trail. Dinner at from the most southern bakery in the USA. DAY 6 - Kona Day: Snorkeling and swimming at Ho’okena Beach Park and visit Pu’uhonua o Honaunau National Historic Park. Dinner in Kona. DAY 8 - Hilo sites - Coconut Island: Boiling pots, rainbow falls. Helicopter flights in morning plus over-night in Honolulu. Accommodation is comprised of seven nights of twin share hotel rooms. The cost of the trip, including most meals, will be approximately $5700pp. The trip is for boys and accompanying parents. Siblings are welcome if vacancies permit. The School does not undertake to accept all applications. On Wednesday 13 February at 6:00pm there will be an information evening for parents of boys in Forms IV and V in P13 (Palladium Classrooms), who are studying German and are interested in participating in our exchange programmes this year. Please send me an email at cds@sydgram.nsw.edu.au to express your interest in attending. The Women’s Association would like to welcome everyone back to school and extend a special welcome to all new families. This will be held on Friday 3 May at 8:30am in the Weigall Pavilion. The SGSWA will be hosting a welcome morning tea on Wednesday 6 March at 10am at the Headmaster's residence. Invitations have been posted out and should be received shortly. We do hope that you are all available to attend. Another date for the diary is Saturday 27 July, 6:30pm for the Form I Dinner. This is a wonderful evening with parents and Tutors. It is an event not to be missed, so please ensure you have saved the date. 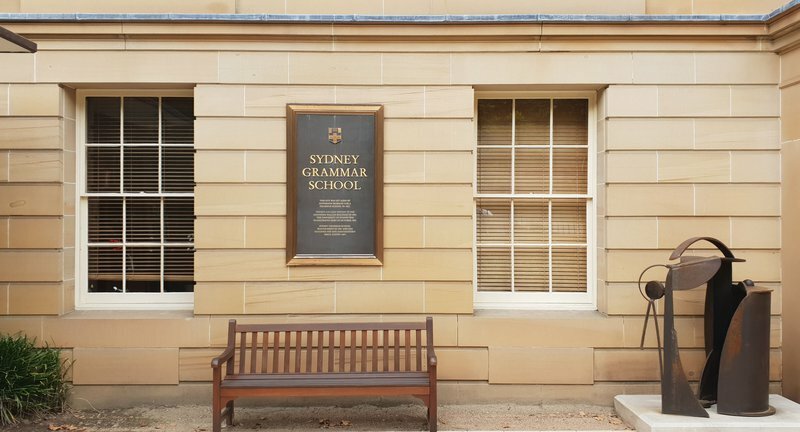 As a Sydney Grammar mother you are welcome to be a member of our Association with a one-off membership fee of $100. The Association is dedicated to supporting and building our school community. If you have not already provided your contact details, or need to update your details please contact Jenny Booth at sgswa@sydgram.nsw.edu.au or complete an online form. This will enable us to keep you up to date and send invitations. Our well-trained volunteers can fit your son, allowing the boys to make their own uniform purchases during lunch times on Mondays, Thursdays and Fridays. For your convenience, credit card details may be securely left with the shop manager, Kim Rossleigh. Volunteering is a wonderful way to meet other mothers while supporting your son(s). It can be on a regular basis or as little as once a year. 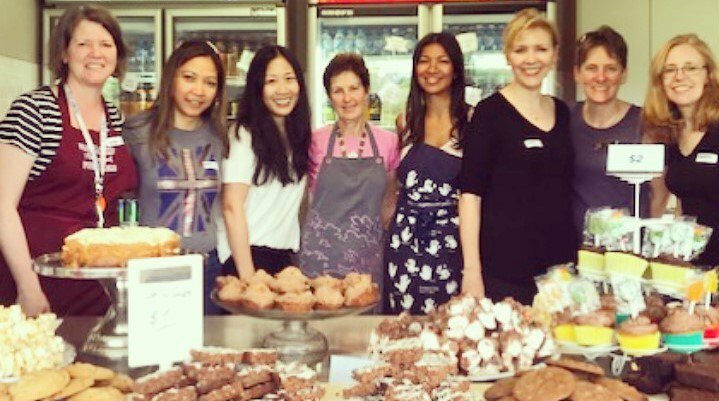 If you would like to be included on the volunteer roster for either the Grammar Shop or Canteen for 2019 or wish to find out more, please contact Jenny Booth at sgswa@sydgram.nsw.edu.au or on 9332 5858. Energetic volunteers (mums or dads) interested in volunteering at the Canteen during Saturday winter home games are required. If your son plays tennis, football or rugby and you’re already at Weigall, it’s a wonderful opportunity to build new friendships and community spirit. For further details, please click here. Thank you to all the volunteers who helped at the Weigall Canteen on House Sports Day (21 November 2018) and for donating delicious savoury and sweet treats. Thank you to Mary Ann Apte, Karen Kay and Anna Reed-Stephenson for coordinating the day. The net profit from the House Sports Day ($1000) will be donated to The Cooper Rice-Brading Foundation (CRBF) which aims to provide long-term funding to find a cure for sarcoma, together with a vastly improved cancer journey, providing much needed hope and support for young sarcoma patients and their families. Cooper Rice-Brading was a pupil at Sydney Grammar School. Cooper's vision was to change the current trajectory for young sarcoma patients. Very early in his treatment for osteosarcoma, he became aware of the disparity that existed between his cancer, and other childhood cancers. He also recognised that sarcoma had the propensity to devastate families financially and emotionally, so the requirement for an improved patient journey, and support of families was paramount to a holistic approach. The Foundation which bears his name, will follow his vision, and SGSWA is proud to raise awareness and to provide funding support. The Women’s Association would like to acknowledge the wonderful work at the Tuckshop and give personal thanks to Roberto and Victoria Fucci, managers of the School Tuckshop. We look forward to a long and happy association. A huge thank you to Mary Ann Apte for coordinating the Second-Hand Book Sale. 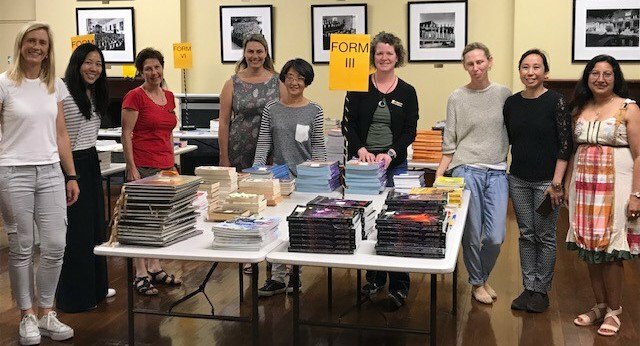 Thanks to the support of the School community, the 2018 Second-Hand Book Sale was well stocked and well supported. We consider it a privilege to facilitate the recycling and reuse of required text books, and at the end of the sale to return over $14,000 to Grammar families. Unsold books have been placed in storage for potential sale in 2019. Donated books that are no longer current texts were donated to charity. The book collection sale ran over five days and was only possible due to the generous and tireless parents who helped receive, sort books, set up, run the book sale, and help pack everything back up! Thank you to all the following parents (and sincere apologies if anyone has been missed – feel free to let us know so we can acknowledge your contribution). For helping co-ordinate parts of the sale day and set up: Esther Heathcote, Anna Reed-Stephenson, Karen Kay & Jenny Booth. Dedicated assistance from Tanya Hickey, Fiona Papadatos, Judy Nguyen, Su Tsung, Ngan Lee, Ingrid Hayes, Feng Jin, Michelle Flemming, Karen Theodore, Hayley Daniel, Sarah Bartlett, Liz Brennan, Karen Nguyen, Shirley Wu, Kris Jones, Andrew Vitalis, Tori Hyde, Lorna Saxbee, Tania Nguyen, Emma Grundy, Karuna Maharaj, Bonny Puszka, Anna Drew, Sally-Ann Crocker, Harini Reddy, Sub Apte, Penny Burton, Jane Brener, Kaylene Kritharides and Suzy Berry. If you are interested in helping out with the Form parties and BBQ, we would love to hear from you. We are especially looking for talented decorators, people with a passion for party music, volunteers for the sausage sizzle or if you would like to be a party convenor. Please email Jenny Booth at sgswa@sydgram.nsw.edu.au with your details, preferred contact number and the year(s) your son(s) are in. On behalf of the SGSWA, I would like to wish you all a happy and productive 2019. The Fathers’ Association takes this opportunity to welcome all new families to the School in 2019. The SGSFA are hosting the Welcome to New Parents Function on Friday 1 March at College Street and would encourage as many new parents as possible to participate in a very enjoyable and informative evening. An invitation will be sent to all new parents soon. For any enquiries, please contact Wendy Scotter at wes@sydgram.nsw.edu.au or call on 9332 5843. All fathers are eligible to become members of the Fathers’ Association and all new fathers who haven’t yet joined will be able to do so at the New Parents' Evening or you can go to the following link any time to join. Please feel free to contact members of the Committee about any matters of interest to you. The Fathers’ Association is happy to assist in any way we can. The most direct method for contact is by email sgsfa.president@gmail.com or the Secretary Dale Druckman, sgsfa.secretary@gmail.com. Any member is welcome to join our regular meetings. The committee and members attend and discuss upcoming events and you can raise topics of interest concerning the Fathers' Association and its support of the School. Normally these meetings are held on the first Thursday of every month during Term time, beginning at 6:00pm at the School. Meetings generally last no longer than an hour and are held in a convivial and constructive atmosphere. Your support is needed for the Association to function. An invite is sent to all SGSFA members, a week before each meeting and the school diary has all the dates. The Weigall BBQ is one of the key functions we organise during winter home games and school sports events. We provide a roster for fathers on our Weigall BBQ website (please click here) to register to volunteer for a few hours to cook for the boys and visitors at our home games at Weigall. Any fathers interested in providing co-ordination support (organising the food, rosters etc.) please contact me at sgsfa.president@gmail.com. Volunteering is a great way to meet other fathers while supporting the boys. It can be on a regular basis or as little as once a year. If you would like to be included on the volunteer BBQ roster or support other functions we provide, or wish to find out more, please contact Wendy Scotter at wes@sydgram.nsw.edu.au or on 9332 5843. All the above information, calendar, contacts and event information is available on the SGSFA website www.sgsfa.com.au. On behalf of the SGSFA, I would like to wish you all an enjoyable 2019.